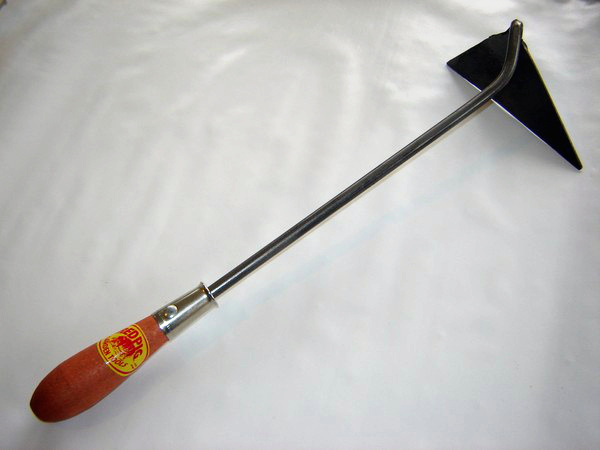 The favorite hand weeder in both Holland and Japan. Some enterprising archeologist should figure out whether these tools originated in Holland and made their way to Japan or vice-versa. I suspect the latter. The Dutch versions are longer and wider than the ones from Japan. That figures because the Dutch are, generally, a taller population.. What the tools have in common are light, thin blades that are unequally triangular in shape, sharpened on the underside and pitched over to slice almost parallel to the ground. There are both left and right handed versions. The long side of the triangle points to the inside. The Dutch tools seem better for rougher work, the Japanese ones being rather delicate instruments. Like all the Dutch versions I've seen, ours has its blade forge-welded to the shank. 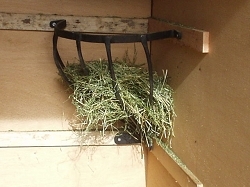 (The Japanese ones are usually tack-welded.) Our tool measures from 16-18 inches in length with a four-inch wide blade. Since this tool has a wide, shallow bevel it needs to be honed frequently to maintain its superb slicing ability.